Rose hip is called the powerhouse of vitamin C, as it contains high amount of vitamin C than any citrus fruits. 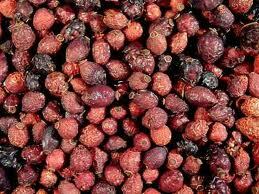 There is approximately 1,700 mg of C in 100 gm of dried rosehip. Rose hips contain vitamin C in a large amount, 40% more than oranges. Rose hips also contain vitamin B-complex in high quantity, and even vitamin A and C, calcium, and iron. Researchers found hints of potassium, silicon, sulfur, and magnesium in rose hip fruits. Rose hips are usually orange to red in color. They are round in shape. In some species, the dark purple and even black fruits are found. The red ones amongst them look like small tomatoes. The wild grown rose hip fruits, supplied by us, contain more vitamins than the cultivated ones. Rose Hip Tea is refreshing, pleasantly heart and contains vitamins A, B, C, E and K, pectin and organic acids. Besides battling colds, the nutrient rich tea boosts your health in other ways as well; it helps strengthen the body's resistance to infection, reinforces digestive function, combats all kinds of illness with fever, flushes out the kidneys and urinary tract and relieves mild rheumatic pain. It stimulates the immune system, increases the flow of urine and has a mild disinfectant effect, rose hip tea can help treat irritations of the urinary tract. Rose-hip tea protects the body against flu.